Most people I think want to eat and be healthy, and butter tastes awesome, but butter is bad for us right? So we shouldn’t eat it? Maybe, maybe not. Once upon a time we ate butter, and fries cooked in beef tallow from small farm cattle operations, and we were generally healthier, then, many misguided people, including people you should never listen to like The Center for “Science” in the “Public Interest”, went on a publicity campaign saying how saturated fats were going to kill us and we should use trans fats instead. Turns out, they were wrong, as our health as a society deteriorated we’ve since discovered saturated fats aren’t all bad, trans fats are bad, omega-6 fatty acids are bad. Now those nutjobs are advocating against trans fats, and conveniently forget they’re largely responsible for the original adoption of those products. Shame on them. Saturated fat is in fact, not bad for you. See here, here, here, here, here. All those butter substitutes we’ve been eating over the years, those are bad for you. For men in particular, saturated fat aids testosterone production. 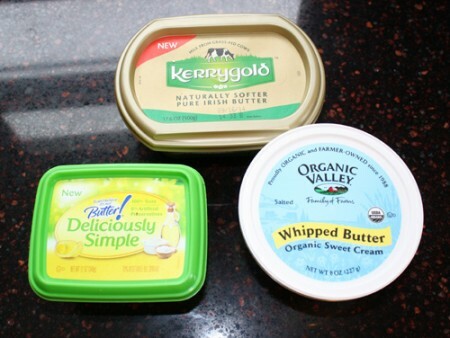 Butter substitutes have largely been made of trans fats or other fats that aren’t healthy. What is a trans fat, by the way? Well, it is about hydrogenation. What is hydrogenation? I’m glad you asked. A saturated fat is a fat in which all available bonding locations on the molecule are full with a hydrogen atom. If you remember High School chemistry you’ll remember that some molecules are more stable than others and generally that stability is caused by the molecules ability or inability to bond to other things. Saturated fats are saturated with hydrogen atoms preventing anything else from bonding to them, so they’re incredibly stable, and generally take a long time to spoil. Manufacturers love them because they make foods last longer. Monounsaturated fats have a single free bonding location, polyunsaturated fats have multiple free bonding locations. These fats are not nearly as stable because that free bonding location can bond with something, and it will eventually, which is why monounsaturated fats (Omega-3s) and polyunsaturated fats (Omega-6s) go rancid (at which point they’re not healthy to eat). So they don’t make good additives to manufactured foods because of shelf life. This lack of stability also effects their ability to take high heat, and high heat can also make such fats less healthy. Hydrogenation is the process of taking an unsaturated fat and adding hydrogen to it to make it more shelf stable. Then it becomes a trans fat. So read the ingredient list. The FDA has minimum thresholds for having to list grams of something on the label in the nutrition information, which is why cooking spray, which is fat, can claim to have 0g of fat. But every ingredient has to be listed so if you see “hydrogenated/partially hydrogenated vegetable oil” it has trans fat, and you should avoid it. Manufacturers initially loved trans fats because they could take a cheap vegetable oil, hydrogenate it, and make it stable (for frying or shelf stability), without having to put the scarlet letter of “saturated fat” on their label. They got the benefits of saturated fats, without the (what we now know to be misplaced) negativity. So, just stick to MUFAs (monounsatured fatty acids, known as Omega-3s) and PUFAs (polyunsaturated fatty acids, known as Omega-6s) right? Sorry, its more complicated. Our bodies do best with a certain ratio of Omega-3s to Omega-6s, and the modern diet is generally out of whack. When we eat far more Omega-6s we induce inflammation in the body and chronic inflammation is now known to be the cause of so much of our modern lifestyle diseases. Further complicating the issue is that most fats are not comprised of a single type of fatty acid. See this nice chart. Olive oil, one of the truly healthy oils, and something you should eat at every opportunity, is 77% monounsaturated fat, 14% saturated fat (yes, there is saturated fat in olive oil), and 9% polyunsaturated. Soybean oil is 61% polyunsatured, corn is 62%, sunflower is 69%. For animal products, fat profile is largely a product of what the animal eats. The old adage, you are what you eat, largely applies. What do you think most of our modern meat machine is fed? So you might think, just buy organic and you’re good. No. Organic is largely a label and most people don’t know what it means. It doesn’t mean healthier, it doesn’t mean safer, it doesn’t mean tastes better. If you buy organic animal products it means the animal was raised without antibiotics, which has no bearing on the nutrition of the meat, it means the animal was not given synthetic hormones (it may have been given natural ones), which may or may not affect you depending on when the last dose to the animal was, generally though I would not worry about that, it also means the animal was generally fed organic feed, and organic feed would be feed that was raised without synthetic pesticides or herbicides, and instead natural pesticides and herbicides would be used (which are still chemicals, by the way). By ordering a milk from a cow fed organic corn and soy you may be doing something for the environment, but you’re not doing much for your health. Buying organic products is largely an environmental choice, not a health one. That is fine of course, just know what you’re buying. When buying animal products the better label is “Grass fed” or “pastured” (which is not the same thing as pasteurized remember). A cow or pig or chicken fed corn and soy is going to have an unhealthy fatty acid profile regardless if that corn and soy are organic or not. When they’re grass fed and given a more natural diet however the fatty acid profile of the animal products changes, and they also pickup more vitamins and minerals as well. When a cow is fed corn and soy, they produce milk with more Omega-6s, when they are fed grass, they produce more Omega-3s, plus a bunch of other benefits. This applies to fish too. Why do we think of fish as healthy, and a good source of Omega-3s? Because fish swim in the ocean eating kelp. In actuality, farm raised fish does NOT have as good of a fat profile typically, because farm raised fish is often fed corn and soy. Four legged animals function the same way, give them a good diet, and they’ll give you healthier meat and milk. Lard from pastured pigs (when they eat grass, weeds, bugs, whatever a natural pig will eat) actually has an Omega-3 content approaching that of salmon. Pigs fed primarily acorns can best it even. Pigs from islands where they eat a lot of coconut (super low in Omega-6) also end up with a really healthy fat profile. This is also why game animals (deer, elk, etc) have a reputation for healthy, they’re not out there eating corn and soy from a trough. In short, to be healthy, it isn’t about what meat you eat. It is about what your meat eats. Knowing all of the above, I wanted a better butter. I have been able to find grass fed beef at our local farmer’s market, bison and pork over the Internet, and I finally found a local farmer with pastured pork I bought a half pig from. I could find some varieties of grass fed cheeses at the grocery store, but no milk, no butter, no eggs. Eggs may have to wait until I have room to raise my own, but after some research I did find some butter. Kerrygold is butter from Ireland where all cows are pastured. I found it at Sams’s Club in stick form but I wanted to find a sub for spreadable butter still. I finally found a Kerrygold “spreadable” butter in a tub from Kroger. My wife also found some Organic Valley organic whipped butter at a health food store, and I also picked up a new “I can’t believe its not butter” product because I thought it might be a viable alternative. Some Organic Valley products are pastured or grass fed, but this particular tub of butter does not say anything about it on the label (also, based on color, I don’t think it is). Kerrygold Naturally Softer Irish Butter: 100 calories tbsp, 35% saturated fat (not that I care). Ingredients: Pasteurized Cream, Salt. Organic Valley Whipped Butter: 50 calories tbsp, 18% saturated fat. Ingredients: Organic pasteurized sweet cream, salt. I Can’t Believe It’s not Butter Deliciously Simple: 100 calories tbsp, 10% saturated fat, 3g Omega 6, 6g Omega 3. Ingredients: Canola oil, water, palm oil, nonfat yogurt, palm kernel oil, salt, natural flavor, lactic acid, vitamin A, beta carotene (for color). Kerrygold states that they get their butter softer by making it from early Spring milk which is softer for some reason to do with the type of grass the cows eat that time of year. Organic valley gets theirs softer by whipping it, incorporating air, so you’re essentially buying 50% air which is why you’ve got 50% less calories, half of that tablespoon is air. ICBINB is getting it done just by using softer oils. 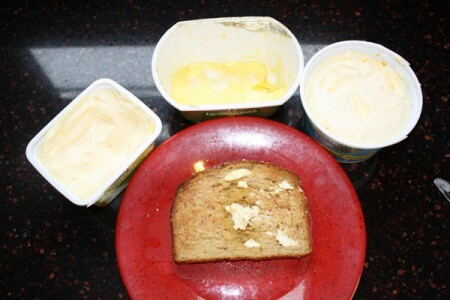 In the spread/melt test, right out of the fridge on hot toast, the ICBINB spread and melted super easy. The Kerrygold performed the worst, it may be softer than stick butter, but it isn’t soft, the organic valley was better than the Kerrygold, but still not very easy to spread. On taste, Kerrygold won easily. It tasted like nice rich butter. The ICBINB tasted like canola oil mostly, which as the first ingredient makes sense, and compared to Kerrygold the Organic Valley just tasted bland. Also, look at the color. Kerrygold is yellow, Organic Valley is almost white. Why? What the cows eat. That is beta carotene and other good stuff the cows accumulate from the grass they eat, color is a good way to know you’re getting grass fed animal products, the fats (yolks, dairy) should also be more yellow. If you absolutely need something to spread very easily right out of the fridge I like the ICBINB. I like that I can pronounce every ingredient it has, I like it has double the Omega-3s to Omega-6s. However, real butter is fairly shelf stable and will not go bad if you let it warm up some, so for everything else I have to recommend the Kerrygold. You can fix the spread problem by letting it warm up, and the flavor and health profile is just so much better because it is grass fed (all Kerrygold products are by the way, including their cheeses). If you’re wondering what about ordinary cooking. I’d never use corn, soy, or “vegetable” oil. I even do not like canola oil. Canola oil doesn’t have the ratio of corn or soy oil, but it isn’t close to ideal still, and I think it can often give foods a bad fishy taste. Olive oil, coconut oil, pastured lard or beef tallow, these are what you want to cook with. And of course, rather than worry about your fat intake, worry about your refined carbs.